To bake something means to cook food by surrounding it with steady, hot air, typically in an oven. In baking, only the bottom burner turns on. This burner generates heat that is then circulated all around the oven to ensure that the outside layer of the food turns golden brown and the inside is cooked evenly. This also means that there is minimal infrared radiation that can burn the top of the food. 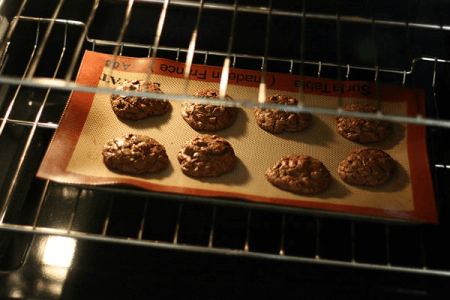 Baking requires an oven-safe container such as a baking pan or a baking sheet (can be glass, silicone, or metal), although some types of food can be placed directly on the oven rack (e.g. pizza). Depending on what you are baking, the temperature needed to bake food can vary from 170 °F to 500 °F and the required time can be anywhere from a few minutes to a few hours. Using a food thermometer or using other techniques (e.g. poking cupcakes with a toothpick) will help you know if the food is finished or not. Baking is a great alternative to other methods of cooking as it does not require adding oil or butter; however, baking has the tendency to diminish the nutritional value of some foods. Prolonged exposure to heat can reduce the water and vitamin content of meats, vegetables, and cereal-based dishes. This is why some types of meat turn bland and dry when they are left in the oven for too long. Examples of foods that are baked are fish, poultry, meat, cakes, breads, pies, biscuits, tarts, cookies, and other pastries. To broil something means to cook food through infrared radiation, which means placing the food very close to the heat source (on the topmost rack). If you are using an oven that has a broil setting, you will notice that only the top burner comes on and it looks like an inverted barbecue grill. The heat does not circulate, but it instead comes from one direction and goes directly to the top of the food. Most broilers can get as hot as 550 °F. This means that you need a broiling pan that can withstand extremely high temperature, such as aluminum, cast iron, or steel. Glass or any other pans made of synthetic materials are not recommended as they may shatter or melt. The broiling time can also vary depending on the type of food, but it usually takes only a few minutes. Broiling sears the outer layers of the food instead of gradually cooking it through the core, so it is perfect for dishes that are not too thick. Tender cuts, thin slices of beef, chicken wings, boneless meats, fish, tenderloins, and some types of fruits and vegetables can be broiled. 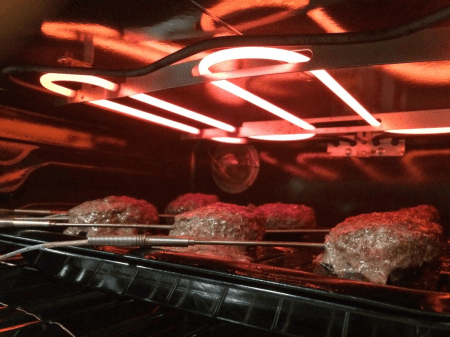 Because broiling involves direct infrared radiation, broiling can easily burn or char foods. It can also cause a lot of smoke (and can be a fire hazard), especially when food that is broiled is too oily because broiling can cause the oil to splatter. What, then, is the difference between bake and broil? To bake food means to surround it with steady heat (170 °F to 500 °F) that usually comes from the bottom burner of the oven. This heat is circulated all around the oven, turning the outside layer of the food golden brown and cooking the food evenly inside. On the other hand, to broil food means to cook it with direct heat (up to 550 °F) coming from the top burner of the oven. The food is placed a few inches away from the heat source so it cooks quickly. This means that the top of the food is quickly cooked and the heat is not evenly distributed. Baking can be completed in a few minutes or a few hours, while broiling takes only a few minutes. Both are quick, but broiling takes a shorter time than baking. Both baking and broiling require pans. In baking, you can use pans made of glass, silicone, or metal. However, glass pans and pans made of synthetic materials are not recommended in broiling as they may melt or break. Baking is perfect for cakes, breads, cookies, pies, meats, fruits, and vegetables. However, it also has the tendency to reduce the flavor and moisture of food, especially when the food is exposed to high temperature for a long time. Conversely, broiling is recommended for foods that are not too thick: thin slices of meat, vegetables, and fruits. Its downside is that it can easily burn the top of the food while the rest of the food is not even cooked yet. It can also cause oil to splatter, thus resulting in a lot of smoke and possibly fire.